I want to publish this experience, because the information is really spotty and hopefully this will save someone from going thru the same unpleasantness. I kind of hope that some officials responsible for this will read it, but that is a far fetch. OK, so our plan was to charter a sailboat in Dubrovnik and go visit Montenegro, especially the beautiful Bay of Kotor (Boka Kotorska). When talking to the the charter company, I specifically told them we want to go there and asked if the boat has all the paperwork. Montenegro is not a part of EU, so I expected some bumps on the road. The booking agent assured me that the boat is ready to go there, no problem. At the base in Dubrovnik, we got a paper stating the owner is OK with us taking the boat out of the country (sort of a “power of attorney”), we got a yellow flag and a Montenegro courtesy flag. The base manager told us to do the check-in to Montenegro in Zelenika port, because supposedly the harbour master in Budva “always made problems”. He assured us the Zelenika crossing was open 24 hours and we can pass thru without any issues. 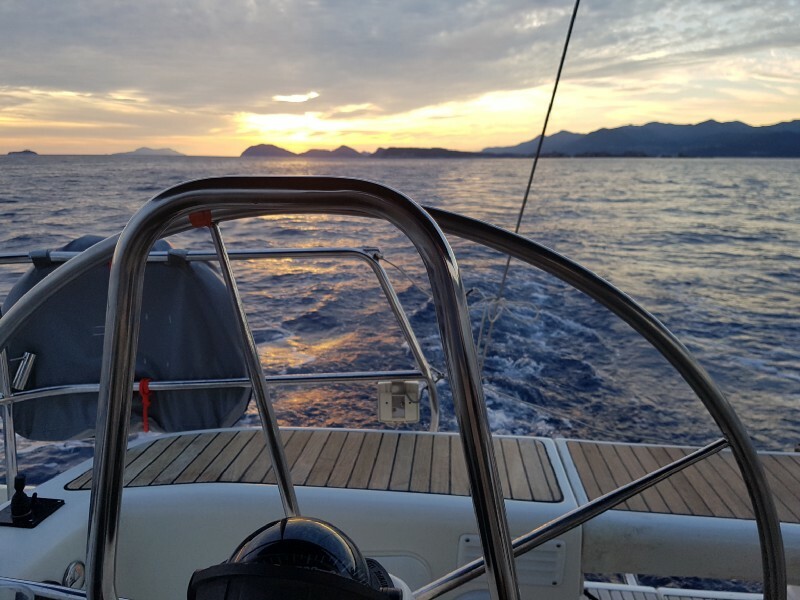 The boat was fine, so we loaded everything and sailed into a beautiful sunset, with a plan to be in Budva in the morning. We stopped in the Gruž port to check out of Croatia. First, I went to the border police. They checked all our passports and sent me to the harbour master’s office. There they verified our crew list and I went back to the border police. I spent a good half an hour there, watching the officer do god knows what on the computer, but finally after a short visit to the customs officer, we were on our way to Zelenika, near Herceg Novi. It was after midnight when we docked at Zelenika port, few miles in the mouth of the Bay of Kotor. We woke up the border police officer, who seemed a little drunk. After checking our passports, he informed us that the harbour master will be open at 8 in the morning, but we are allowed to spend the night there. How nice of him. We asked if we are allowed to continue to Budva and do the check in there. Even asking three times, I was unable to pry a direct answer out of him. But he did not specifically forbid it either. We had things to do in Budva in the morning, so the decision was made to continue to Budva and do the check in there. We arrived in the Budva bay around 4 in the morning and anchored close to the customs quay. In the morning, we hoisted the anchor and moored at the customs quay. They checked our passports and I had to write up a Montenegro crew list, because apparently Croatian crewlist is no good here. After that, they informed us that we need to purchase a vignette for the boat (which we knew), but the harbour master’s office is closed on Sunday, so we have to do that Monday at 8 o’clock. After asking if we can sail around Budva that day, the officer said it was “probably OK”. What a great peace of mind that provided. Anyway, we returned to sea. The wind was favorable, so we enjoyed some wonderful sailing and met some friends during the day, which was the main reason we wanted to be in Budva. In the evening, we came to the Budva marina and moored there. The concierge took our papers, but was surprised we did not have the vignette. I explained that the harbour master’s office was closed on Sunday and that we will get the vignette in the morning. She was not sure what to do. It seemed we were the first ever boat to arrive in Budva on Sunday. After making some calls, they took me again to the border police booth. The officers told her the same thing I did, so the marina staff decided to let us stay for the night. In the morning I took all the ship papers to the harbour master’s office. Finally, we were going to get all the formalities sorted and could go do what we came here to do – sail. However, after thoroughly checking the papers, the harbour master informed me, that the boat does not have a valid third-party liability insurance and therefore he cannot issue me the vignette. He pointed to a fine print in the insurance policy, where it stated that the policy is valid only in Croatian national waters. Although I cannot fully understand Croatian, I did understand this sentence. I phoned the charter company, who claimed the boat has insurance, but they cannot help me in any way now. “I told you to go to Zelenika,” the Croatian base manager said. Now I understood why he said it. The Budva harbour master indirectly confirmed, that the check in procedure Zelenika is very lax and that they let many boats from Croatia pass without insurance. Whether that is because someone slipped them some money or just negligence, I do not know. check out of Montenegro, go back to Croatia and spend the rest of our trip there. The fact, however, remained, that we probably really did not have a valid insurance for the boat in Montenegro and should anything happen, who knows how it would end. So we decided to go back to Croatia and leave the Bay of Kotor for next time. We sailed back past the mouth of Boka Kotorska to Cavtat, which is the first port in Croatia coming from Montenegro. We docked at the customs quay, only to be told that it’s closed for the night and we have to go another 10 miles to Gruž to do the check in. When checking in, I realized I do not have the boat registration with me. Cold sweat came over me. I must have left it in Budva. The border police made copies, but they probably left the original in the copier. They made copies of several of the boat documents, lot of paper was handed over from one side to the other. Then I remembered, that the harbour master made copies of the registration and handed them over to me, when he refused to give us the vignette. That saved the day, because the copies were enough for the police officer. Luckily, we had one member of our crew in Budva still on some business. He was supposed to meet us back in Cavtat the day after. After a lot searching, the Budva border police finally found the original registration papers and gave them to our crew member, who brought them over. Phew. We spent the rest of the week sailing in Croatia. After returning, the charter company clerk claimed she was unaware, that the boat had no insurance for Montenegro. She said she’ll “check with the boat owner”, which was yet another company. I’m pretty much convinced they knew and were just trying to save money. I did not press the issue further, because fortunately nothing bad happened and we wanted to go home in peace. Triple check your boat has insurance outside of Croatia and demand written proof. Not just for yourself but for Montenegro officials. Try to avoid crossing the border during weekend or at night. If you really need to, look up phone numbers and call beforehand, so you are sure someone will be there.